"Don't open that door!!" Paramount has debuted a mysterious new trailer for a film called 10 Cloverfield Lane, which they're marketing like it has a connection to Cloverfield. J.J. Abrams produced this movie, originally called Valencia, and claims it is a "blood-relative" of Cloverfield even though the footage lines up with exactly what we've been writing about for years. Mary Elizabeth Winstead stars as a woman who ends up locked in an underground bunker with John Goodman and one other. The rest of the story is pretty standard, as it becomes the question of, is it really that bad out there? I believe the entire Cloverfield angle is a marketing gimmick to get us all talking about the mystery of what's going on, but nothing more. The original description for Valencia: "The majority of the movie takes place in an underground cellar, and revolves around a young woman who wakes up in the cellar after a severe car accident and fears she has been abducted. Her captor, a doomsday prepper, tells her he saved her life and that there has been a terrible chemical attack that has left the outside uninhabitable. She does not know what to believe and as tensions rise, she decides she must escape, regardless of the terrors that await outside." 10 Cloverfield Lane, formerly known as Valencia, is the feature directing debut of Dan Trachtenberg, who made the Portal: No Escape short previously. The screenplay is by Josh Campell & Matt Stuecken and Damien Chazelle (of Whiplash). 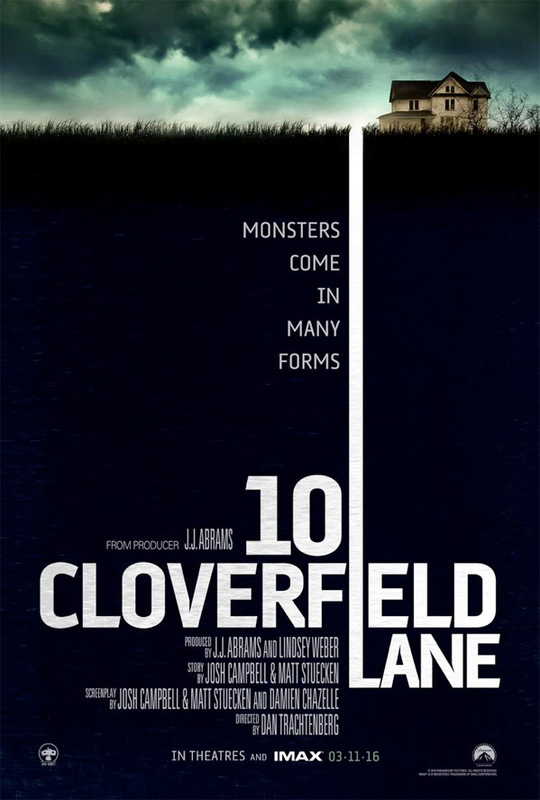 Paramount will release Trachtenberg's 10 Cloverfield Lane in theaters starting March 11th. Thoughts? If you listen closely to the rumbling sound at the very end there is a faint hollow growling sound that is overlaid. It resembles the roar from the giant monster in Cloverfield. Easter egg for sure! I kinda hope its related to Cloverfield in a direct sense. If it isn't, then none of this marketing, title included, make any sense. I'll be pretty mad if that's the case. I'd love for another story set in that event, and this is certainly intriguing. Best surprise of the day. Cool trailer. Love that Goodman. How is it ridiculous music? It's a well-known classic pop song (using the original no less) that's then manipulated to turn into a menacing soundtrack to the shift in the narrative of the trailer. I found it very effective and creative. The bizarre tone was the point. Goodman is actually a very versatile actor. He can be very menacing when he wants to be. He's absolutely suited for this. Ridiculous music? The Tiffany song starts off with references to playing and carefree youngsters, rather a match with the images the trailer shows us in the beginning. Then the tone of the song gets more grim as we see more tension building up in the images. Too long before anything happens? After only 34 seconds the earth starts to shake rather heavily. Doesn't that count as something happening? To me there was no need to read the synopsis, the trailer appeared to explain itself without revealing what exactly is going on. Why is John Goodman in this? Perhaps because he is a good actor? Goodman doesn't fit this kind of film? Why? The man has done comedy, drama, thriller, action, etcetera. And how do we know what kind of movie this is going to be anyway? The trailer is really not revealing that much. Is it a monster movie? Or is Goodman the monster? Or...? It's Abrams. So much of it will remain a mystery for the next months. Cloverfield was rubbish? I happen to agree with those 271.000 plus IMDB users who gave that movie a solid 7. Tiffany song?? Hahaha. Umm, no. That's not her. It's the original hit single by Tommy James and The Shondells. But I agree. VERY effective use of music in this trailer. Of course like anyone else I too can hear that this is not Tiffany. I called it "The Tiffany song" because she has done the song too. But to be honest, I had never heard the original before. It was released while I still was a baby. Must have missed it afterwards. Seems a little like that short you posted Alex, where there is a genuine threat outside, but the kid doesn't believe her parents. Turns out they weren't lying. Hope they don't get spiders bursting out them. Oh the possibilities! JJ always seems to have an ace up his sleeve. If this didn't have the Cloverfield name attached, I would have thought that this is a small supernatural psychological indie horror set mostly in a single room, like a minimal 'The Thing' or at best like 'Bug'... something we've seen many times before. BUT, hoping it has something to do with Cloverfield, I really hope that the trailer only shows the beginning. Plus the direction seems really slick, and John Goodman is a hell of an actor. One major win is abandoning the found-footage style. Another is the great cast. I just wonder how much you get to see of the outside world. I assume the "Cloverfield" attachment is there to tease people with the idea that we will see some crazy monster destruction outside the shelter. If using the Cloverfield name is nothing more than a gimmick, then why would they be releasing this movie in IMAX? Have you seen a girl with the hair like this..? The Monster is probably just Mr.Abrams stomping about with a massive hang over due to drinking all the celebratory Star Wars bevy.